The Flag Festival forms a major part of the Ilminster Midsummer Experience. Last year we put up over 100 flags including the stunning banners designed by Patrick Reyntiens and John Reyntiens in the Minster Church. There will be several new flag designs this year. 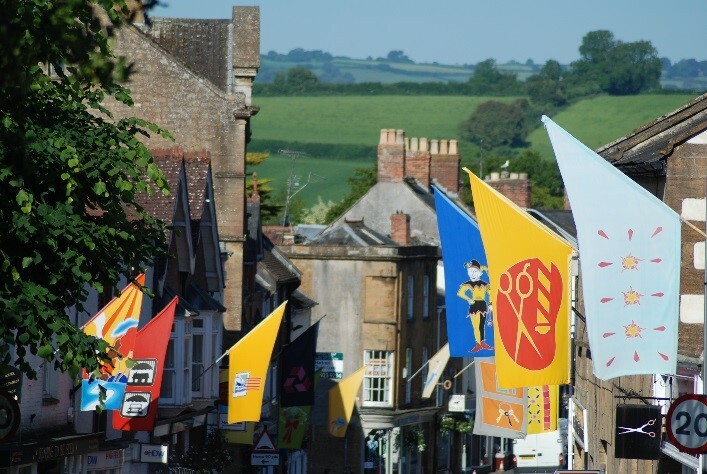 We are fortunate that the town’s mediaeval road layout, which hugs closely to the 15th century Minster church, dramatically emphasises the effect of the flags and brings vibrancy and colour to the town. The Flag Festival grew out of an idea from one of the town’s artists. We were able to commission a flag-maker to work with children from Greenfylde School to design the original 20 flags. These were so successful that the following year we invited businesses to contribute to their own flag and the majority of businesses in town now have a flag – some even have two! Make a date now to come down to see the festival and enjoy a cup of tea and cake or a delicious lunch in one of the many coffee shops or pubs in town.